"You didn't come here to make the choice, you've already made it. You're here to try to understand why you made it." I have seen many films that probe the themes of existence, destiny, and freewill, but few that prove as fun as The Matrix Reloaded. A tasteful blend of science fiction, martial arts, Hong Kong action, and brain bending philosophy, the Matrix films have earned a rightful status as the thinking person's action films. This second entry in the trilogy delivers the frenetic thrills seen in the best action pictures, though I found the experience to be equally cerebral. I hold no reservations in stressing that it is absolutely mandatory to first see The Matrix before watching Reloaded, as creators Larry and Andy Wachowski show no sympathy for those who are unfamiliar with the Matrix universe. Unlike most sequels, there is no back-story, no plot rehash, and no character re-introductions, but rather layer upon layer of new developments on top of the already overwhelming amount established in the first film. 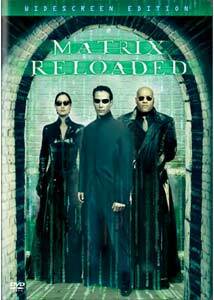 While the essence of "the matrix" is ostensibly explained in the opening chapter of the trilogy, Reloaded dispels many of those ideas and tumbles us further down the dizzying rabbit hole. The central concept, however, is still evident. As discovered in The Matrix, reality is nothing more than "the world that has been pulled over your eyes to blind you from the truth." I will refrain from spoiling specific details to those who have not seen either film. Let me just state that the "truth" is not pretty. Reloaded finds Neo (Keanu Reeves), Morpheus (Laurence Fishburne), Trinity (Carrie-Anne Moss) and the ever-growing human resistance preparing for a war against the machines that have enslaved humanity for over a century. They have discovered that 250,000 squid-like sentinels have been dispatched and are tunneling towards the great human city of Zion. In less than 72 hours, the sentinels will reach their target, and Zion will be destroyed. Neo, who has been prophesized as "the one" to defeat the machines and save mankind, once again seeks counsel from The Oracle (Gloria Foster) to serve him on his quest. She leads him to the Keymaker (Randall Duk Kim), an exiled program somewhere in the matrix who may hold the secret to penetrate the machines' defenses. The story may sound rather silly, but the Wachowski brothers have constructed the pieces brilliantly from an unusual blend of influences. It is rare for an action film to challenge the mind, but Reloaded succeeds on levels where many similar films fail, and others do not even aspire. The brothers have not just created a typical sequel where the same characters are caught in similar situations, but rather a continuation of a much larger story. Elements that initially may seem like nothing more than a method of satiating fans of the first film, such as Trinity's love for Neo and the return of the nefarious Agent Smith (Hugo Weaving), have been meticulously crafted to serve the greater purpose of an elaborate story. The Matrix was abundant with action sequences like none other we had ever seen before. The action in Reloaded does not prove quite as awe-inspiring simply because it no longer feels like uncharted territory. Each of these sequences, however, fuels the narrative rather than simply being thrown in to astonish the audience. Most impressive is a dazzling 15-minute freeway chase filled with mind-boggling effects work. I nearly fell out of my seat as the camera zoomed underneath semi-trucks, in between speeding cars, and high above the city. Also included is the "burly brawl", which finds Neo battling innumerable clones of Agent Smith. Though this conflict does serve a narrative purpose, I did find it to be excessively drawn out. Simultaneously the most satisfying yet frustrating aspects of Reloaded are the philosophical musings. The Oracle, The Architect (Helmut Bakaitis), and the enigmatic Merovingian (Lambert Wilson) pummel us with a wealth of existential perspicacity, none of which can apparently be taken at face value. While these scenes suffer somewhat from the Wachowskis propensity to "tell" rather than "show", the concepts are undeniably fascinating and worthy of discussion. We will have to wait for the third entry in the trilogy, The Matrix Revolutions, to see if we are given any answers to the many questions Reloaded introduced. While the incomplete nature of Reloaded maddened plenty of viewers, I found its ambiguity to be part of the fun. The Wachowski brothers are wise enough to understand that the power of motion pictures does not merely lie in the viewing experience itself, but also how one carries that experience with them long after. The six-month wait between Reloaded and Revolutions has allowed fans to gain a more interactive experience of the Matrix trilogy, invoking fascinating theories as to what the final chapter might hold. While I have my ideas, I can only hope that the Wachowskis have not gone the same route as X-Files creator, Chris Carter, and generated more questions than they can ever hope to successfully resolve in Revolutions. Image Transfer Review: Those who are disappointed with the transfer of the first film in the trilogy need not fear. The 2.35:1 anamorphic widescreen transfer of Reloaded looks better than I could possibly have imagined. Warner has wisely decided to include only the feature film on Disc One, allowing for a higher bitrate and therefore producing a stunningly accurate representation of the theatrical exhibition. The overall image is razor sharp and consistently smooth without the slightest hint of video noise. Even the bright white interior of the Zion control station introduced no perceivable picture anomalies. I marveled at the level of detail in the many intricate shots, such as when the Nebuchadnezzar docks at Zion. About the only nit pick I can make is the occasional sign of edge enhancement, yet its presence is so minor and infrequent that I was never bothered or distracted by it. This is a beautiful reference quality transfer. Audio Transfer Review: Being an action film, I was not surprised to discover that the 5.1 Dolby Digital soundtrack is abundant with aggressive split surrounds and earth shattering bass. What truly impressed me was how naturally the soundtrack comes across, drawing me deep into the heart of the story without ever calling attention to itself. Some may feel that the soundtrack is lacking dynamism, but subtlety is actually its strongest attribute. The soothing warm tonality and seamless soundstage kept me completely enthralled in the film instead of sporadically focusing on any quirks in the sound design. For those who love low end, Reloaded has got plenty of it. The deep bass had the foundation of my home shaking on several occasions, but never did it feel boomy or overbearing. Dialogue sounds about 3 dB lower than normal, yet I never had trouble hearing or understanding spoken words. Those looking for a soundtrack that constantly bombards the listener with one gimmick after another will likely be disappointed, but those who crave tasteful and elegant sound design will be undoubtedly satisfied. Extras Review: I assumed the worst when I saw the list of special features offered, fearing it would be nothing more than superfluous material. While it does partially consist of filler, this is counterbalanced by three fantastic documentaries. Somewhat disappointing is the absence of the Reloaded theatrical trailer, though one can find the Revolutions trailer at the end of the closing credits on Disc One. The first documentary is Preload, which is an extensive behind-the-scenes look at the making of Reloaded. This is a wonderfully comprehensive look at the hard work that went into creating the sequel, including telling interviews with the cast and crew, candid production footage, and a glimpse of the original storyboards and animatics. A generous wealth of information is packed into this 22-minute documentary, though I never felt as if any one section was rushed. The Matrix Unfolds is more of a fluff piece, but nevertheless worthwhile. Here we learn how the story of The Matrix spans several different mediums, including the trilogy of films, the anime-inspired The Animatrix, and the Enter the Matrix video game. I highly recommend fans of the film to check out the latter two, as they provide insight into the story untold by the feature films. Next, is Freeway Chase, a compelling documentary covering the laborious efforts that went into designing and executing this exhaustive sequence. No expense was spared to bring the chase to life, a task that included the complete construction of a massive freeway as well as sending the main actors to stunt-driving school. I was not certain I wanted to know the magic behind the freeway chase, but after several minutes into this documentary, I could not turn it off. Get Me an Exit is merely a shameless look at the extensive product advertising that ties in with the film. While it was somewhat interesting to see how they created the advertisements based around the look and style of the movie, I found this to be nothing more than an extended commercial. Enter the Matrix: The Game is a 28-minute look at the creation of the video game. Knowing very little about this, I figured a half-hour look at the making of a video game would be quite tedious. What I was not aware of was how closely the game ties in with the film trilogy. The Wachowski brothers not only created the game, but also directed the main actors from the film in what could be considered The Matrix 1.5. After watching this informative documentary, I am compelled to play the game. A slick trailer for The Animatrix is also included. For those who have not seen this animated collection of nine shorts, it is strongly encouraged, as it fills in the gaps of the trilogy. Last, and certainly least, is the MTV Movie Awards Reloaded skit. This waste of time and space is a Reloaded parody used to promote the opening of the MTV awards show. It is neither particularly funny nor clever. While The Matrix Reloaded may sometimes forget the important lesson of "show don't tell", it is nevertheless a highly entertaining, cleverly constructed hybrid of science fiction, marital arts, and East-meets-West philosophy. It is rare that escapist entertainment is successfully combined with thought-provoking thematic elements, much less with such admirable results. This enigmatic second entry in the Matrix universe is not only a well-crafted action picture, but also an insightful exploration into the themes behind our existence. Complete with exceptional audio and video transfers, Reloaded is guaranteed to keep fans satiated while they eagerly await the arrival of the final chapter in this entertaining trilogy.